We’re really not kidding when we say, you can beautify your property while correcting drainage problems. Landscape drainage technology has come a long way in the last 5 years. Actually, it can even help improve the value of your property. 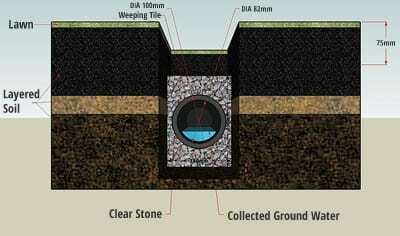 Traditionally, driveway drainage is handled by a trench or channel drain and that’s a valid means to route stormwater. But there’s a better way that’s more environmentally friendly and aesthetically pleasing. 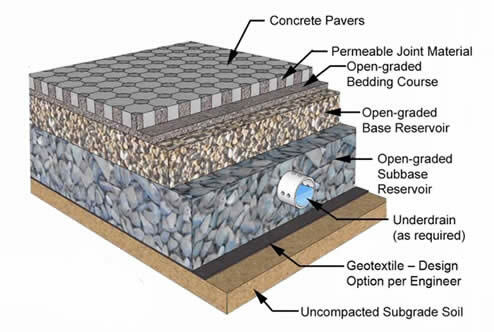 Ever Heard of a Permeable Driveway? You can have a gorgeous stone driveway that allows water to drain right through it. This eliminates the need for unsightly drain grates along the perimeter. This is cutting edge technology in stormwater management and it’s the only truly responsible way to deal with your stormwater. Plus, in Westchester New York, construction laws dictate, stormwater must stay on your property. It’s also a great alternative to blacktop. It’s long lasting and has excellent curb appeal. Do You Have a Soggy, Wet Lawn? We often find that wet lawn problems are largely due to poor soil composition, or grading issues. 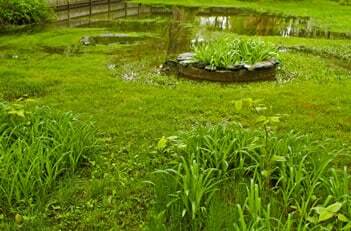 But sometimes a wet lawn can be a sign that you may be in need of septic system repair. Water will take the path of least resistance… if the soil’s composition allows the water to easily move through it, you’re in good shape. However, if your yard is largely clay soil, you’ll need some subsurface drainage work. The weapon of choice to combat a soggy lawn is the french drain, also called a curtain drain. The severity of your problem will dictate how much trenching will be needed to move the water. After trenching the area, we install one or more perforated pipes surrounded by gravel. Settling water collects in the pipe and is taken to a subsurface dry-well area, or to a designated above ground area that won’t impact your living space. Many wet basements are either caused by old nonfunctioning gutters, clogged footing (foundation) drains, or both. If we come across a wet basement or a drainage problem we will try to address it on the outside before the water makes it into the house. If the site allows, we will open up the foundation and do an inspection of the structure and drainage. We’ll patch any holes or cracks in the foundation. Apply a tar coating and membrane cover.